We opened our first location in South Florida in 2009, followed by Atlanta in 2010. We have since continued to expand our business each year into additional locations throughout the country. All of our partners have a long history within the concrete, coatings, construction, and home improvement industry, including working for many years for the Rust-Oleum Corporation, a leader in industrial floor coatings & installation. 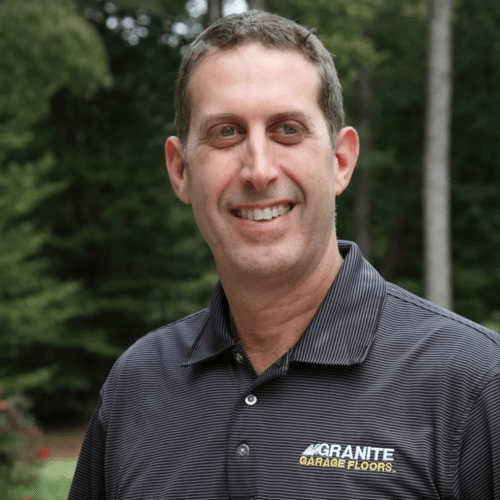 After nearly a quarter century of working in Corporate America, we decided the timing was right to utilize our experience & know-how to launch Granite Garage Floors. Our goal remains the same today as it was in 2009 - to offer quality industrial garage flooring options to the residential market along with unmatched dedication & commitment to customer service, which has proved to be essential to our success as independent business owners. In 2012, after upgrading over one quarter million square feet of garage floors with our most popular “Granite Finish”, we decided to re-brand our company to GRANITE GARAGE FLOORS®. As a result, our name represents the look, quality, and longevity of the garage floor coating system that our company installs. As the years have passed, we continue to closely align ourselves with the best suppliers in the coatings industry, providing our customers the most cutting-edge products in coating technologies & installation techniques. Consequently, this has has resulted in countless satisfied customers. Since garage floor coating systems is our only business, it enables us to be 100% focused on one specific discipline –Providing the highest quality customer experience, from the initial consultation to the final installation. Our company is founded on the principles of quality, service, and value. Our installation teams are professional, experienced, and take pride in their work. This focus on excellence results in extreme attention to detail and finish quality. Our installers live by the saying, “The Finished Result is what is most important, not the act of doing it”. Our confidence in our product, process, and team allows for us to personally stand behind our systems with a “Lifetime Satisfaction Warranty” that is guaranteed against hot tire pick-up. Each location is locally-owned, operated, and fully insured to include an entirely transparent platform providing neighborhood references and access to all of our previous online reviews. We strive to provide the highest level of customer service, including arriving on time, finishing on schedule, and cleaning up after ourselves upon completion. When Granite Garage Floors has completed your Garage Floor Upgrade, your investment will result in a garage floor that Looks and Lasts Like Granite®, while adding value to your home. If you are interested in learning more about the benefits of Upgrading Your Garage Floor® with the Granite Garage Floor system please contact us. Thank you for your interest in our company and we look forward to earning your business! Because garage floor coating systems is our only business it enables us to be 100% focused on all things relating to garage floors from the product, to the installation, and, most importantly, our customer.